Foreigners are known in Mandarin as “ke ren”, or guests. 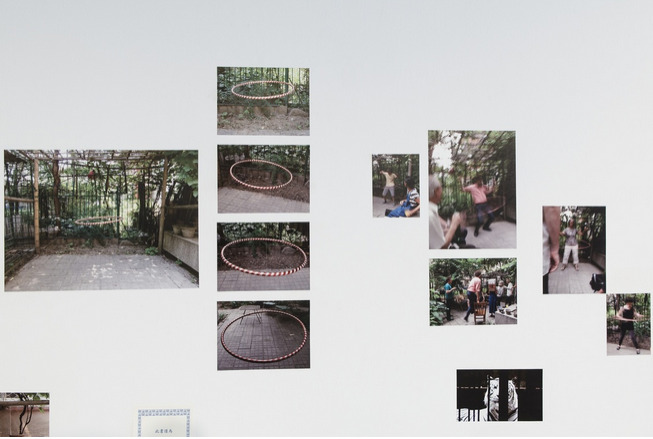 Aware of our foreignness in Beijing, Stephanie Shepherd and I decided to reflect on this through an impromptu curatorial project based in the backyard garden of our second Red Gate Residency apartment. This outdoor garden space, a rarity in the high-rise dominated Tuan Jie Hu neighbourhood, was one in which we were separated from our neighbours, yet highly visible through an enclosing fence. For this project we produced t-shirts with a Ke Ren Yuan / Guest Garden logo, loosely drawn from that of a nearby pastry store, as well as contributing Balfour’s hula hoop (Willing Suspension of Disbelief) and Shepherd’s stumbling block sculpture (Stubborn Object Number One). We invited other artists who were foreigners, both short-term art residency participants and longer-term expatriates living and working in Beijing, to produce artwork for the one-day event. Guest artists were Erin Coates, Michael Eddy, Jean Klimack, Doug Lewis, Justin Spiers, and Emi Uemura. In proposing something for the Caochangdi bathhouse, and with Forget Art in mind, I wanted to work with materials that would be familiar and yet might catch people’s attention. When I visited the bathhouse, I noticed products for sale at the counter, such as small towels and toiletries. At the jinkelong, or supermarket, near my Tuanjiehu apartment, there was a wide range of diverse goods, from fresh produce to instant ramen, and even a specialty tea shop. From a huge display of soap, I chose several kinds based on colours and brand names that attracted me. For the bathhouse installation, I chose to submit three small clusters of soap, stacked without the use of any other materials. I left what happened up to chance – hoping someone might decide to use some. At the end of the exhibition, I was happy if anyone who wanted to have some soap took it away. Art, Beijing. Curators: Yam Lau & Michael Yuen. My Red Gate residency apartment was situated in the north-eastern part of Beijing, just beyond the Third Ring Road and close to one of the famous Da Dong roast duck, or “Peking” duck, restaurants. I at first didn’t connect the opulent and somewhat forbidding exterior of the restaurant to the daily activity that took place in view of my apartment windows. I was in fact watching what took place behind the restaurant. This outdoor space seemed to expand and contract, depending on whatever was taking place; at times frenetic, at other times quite peaceful, but always captivating. A pattern soon became discernible: early morning wood deliveries and pyjama-clad waitresses going to the nearby bathhouses; fresh produce and mantou (steamed bun) deliveries by bicycle, cart, and van; twice daily roll calls for the cooking staff; and an assortment of idiosyncratic, intermittent events (a bicycle covered in bags of mushrooms, a woman weighing herself on the food scale, a lone chef taking a break and talking on her cell phone). I also became aware of another dynamic, involving the one and the many – the activities of isolated individuals juxtaposed against those of groups. The photographs I took over two months in the Fall of 2009 document my ongoing fascination with how the Da Dong staff used this public space over the course of their working hours. Inspired by a hula hoop left in the Red Gate residency apartment, I taught myself how to use it, somewhat successfully. Although at first held in suspension under the pergola in the backyard for the Guest Garden event, it was soon taken down and put into use by those present.